30 Chaitra, 1425 (13 April, 2019) YOU ARE ALL CORDIALLY INVITED. Organized by Nayakrishi Andolon, Nabapran Andolon, Beez Bistar Foundation and UBINIG. T A N G A I L Celebrations, On 30th Chaitra, 1425 (13th April, 2019) special meals with shaks will be prepared by farmers, and everybody is invited to taste the food. Nayakrishi farmers will collect at least 14 Shaks (leafy vegetables) from the pesticide-free environment of their Nayakrishi villages, along with other vegetables. They will cook them at Ridoypur Biddaghor. This will be a concrete entry to formal and informal discussions about the situation of biodiversity, food safety and food sovereignty as audited through the collection of the uncultivated leafy greens and species and varieties at risks. The discussions concretely frames practical and meaningful assessment of the state of environment, ecology and biodiversity and facilitates concrete plans that farmers can implement. The local traditional performances of Shiva-Parbati and other characters of Puran will also happen on Chaitra Sangkranti during the day. Nabapran Andolon will perform traditional folk songs and Lalon songs throughout the day. Tangail Venue: Ridoypur Biddaghor, village: Bishnupur, Pathrail Union, Delduar Upazilla, Tangail [It may be noted that Delduar Upazilla has been declared a Safe Food Upazilla by the Delduar Upazilla Parishad. In Dhaka, ADDA, Shashya Prabartana and Narigrantha Prabartana will organise a lunch meal with 14 shaks (leafy vegetables) and different varieties of lentils. There will be NO option of fish and meat curry. This will be cultural and vegetarian delight and you should bring your friends and particularly children, so that they learn about the traditions of Bangladeshi food systems. Chaitra Songrakti is more rooted in the cosmogony of indigenous world view and celebrated as the cyclical renewal of biological and natural energy implicit in the unitary relation between human beings and the world. The word ‘songkranti’ implies the moment of transition that has no beginning and no end; the notion is not linear, but cyclical. The sun moves through space and every month crosses each of the signs of the zodiac, known as Rashi, and completes twelve cycles of the year. So there is no ‘new’ year but return of the cycle, or the ‘chakra’. In the cyclic movement, every point is literally the end of the cycle as well as the beginning. There is no new beginning, and therefore no ‘past’ in the linear sense of the term. The word ‘songkranti’ captures this notion of the eternal return of the ‘origin’, where the ‘origin’ cannot be located in any linear scale of time but in the omnipresent everywhere. If we draw a line we can locate a point where the line begins and ends. Any point could be the beginning. This is not the case with a circle. A point in a circle is both its origin as well as its end; it starts and closes a cycle. In Bangla the cyclical return of time is also known and experienced as ‘Ritu’. The word ‘Ritu’ is usually translated as ‘seasons’ and thus it loses the context of the cyclical notion of time. Time is not merely any objective time outside human beings, but the eternal return of a unique being in the womb of the universe. Time presupposes this corporeal being, the human. The yearly solar cycle starts on the last day of the last month of the Bengali year. The cycle ends and begins on Chaitra Sangkranti. It is on the 30th of Chaitra. In Bengali culture, celebrating Chaitra Sangkranti is more important than celebrating Pahela Baishakh or New Year’s Day, which we inherited as a colonial legacy. Pahela Baishakh festival was introduced by moneylenders and Zaminders (Landlords) during British colonial period. The moment of transition is very brief. So celebration to mark the transition can be as long as one wishes. In the villages of Bangladesh it could be a week or more, and may include the first day of Baishakh as well. Since the notion of time follows the seasonal pattern, it defies linearity. The time in ‘songkranti’ comes back again and again and it is never a ‘new’ time. The first day of Baishak, however, is considered as the beginning of the new year for collection of revenue. During the reign of Mughol emperor Akbar, there was difficulty in raising the revenue from the peasants in Bengal. It was felt that the transformation of the lunar calendar to solar calendar and creating a new one might be helpful. The new calendar was called the Bengali calendar. 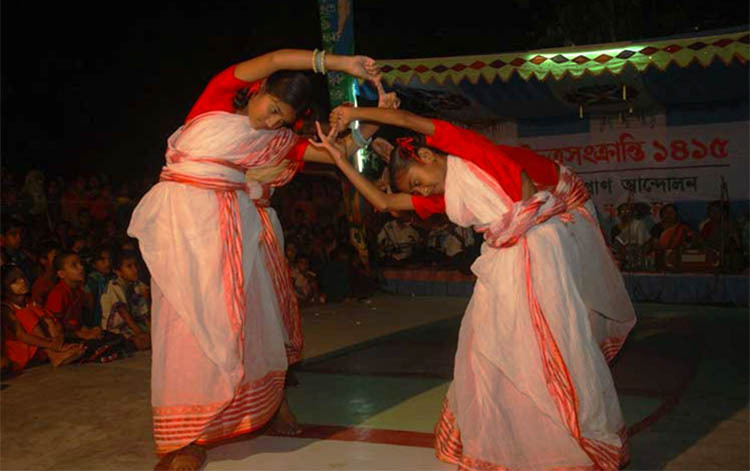 As Bengal is an agro-based country, the Bengali calendar is widely used among the peasants for the timing of cultivation, particularly for the sowing, planting harvesting and marketing of agriculture products. It is intimately linked to the life of rural agrarian people including the rural craft. Most agricultural activities are related to the Bengali calendar. Women are particularly active in the Chaitra Sangkranti as they want to carry out the environmental and ecological audit to find the natural balance in their areas. Women go out to collect uncultivated green vegetables called Shak. They must find 14 different kinds of shaks, which are uncultivated which grows near the homestead land as well as in the further places and in open water bodies. This becomes the most important part of Chaitra Sangkranti - cooking 14 different kinds of shak (herb), preferably uncultivated; among them one shak must be of bitter taste. Usually they find Gima Shak (a bitter shak) in their surroundings. No fish or meat is cooked. However different varieties of dal (pulses) are cooked as supplementary food.